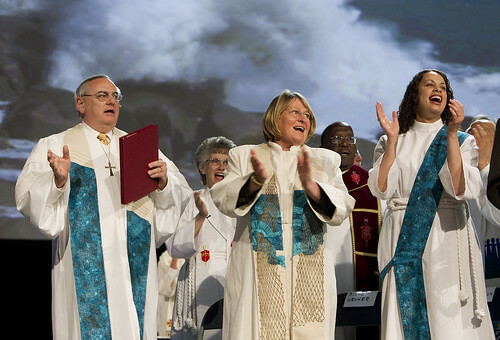 Celebrating opening worship at the 2012 United Methodist General Conference in Tampa, Fla., are (from left): Bishops Larry Goodpaster, Peggy Johnson, Rosemarie Wenner and João Somane Machado; and the Rev. April Casperson. A UMNS photo by Mike DuBose. Click on image to enlarge. The 2012 United Methodist General Conference was washed in the sights and sounds of water as delegates from around the world began 10 days of work with a worship service that invited them to discipleship by the sea. Marcus Briggs-Cloud, a member of the Maskoke Nation and a son of the Wind Clan People, consecrated the worship and workspace in his native language and tradition. He asked the delegates to be mindful of the land where they are meeting. "We are not your history, we are not Tampa's or Florida's history," he said. "We are living, breathing vibrant people. You are welcome in our homeland." One of the highlights of the April 24-May 4 conference will be "An Act of Repentance toward Healing Relationships with Indigenous People" on April 27. The service grew out of an incident in the United States known as the Sand Creek Massacre in which Col. John Chivington, an ordained Methodist clergyman, led troops in attacking an encampment of Cheyenne women, children and elderly people, killing at least 165. Marcia McFee, director of worship, was inspired by the stories of Jesus at the shoreline of the Sea of Galilee and the Tampa Bay setting. Videos, graceful dancers and flowing music set the tone as nearly 1,000 delegates prepare for the long hours and difficult decisions ahead. Bishop Larry M. Goodpaster, president of the Council of Bishops, invited the 4,700 at the worship service to hear the call of Jesus in the "midst of all the legislation that will crowd our time and drain our energy." "Like the first four beside the Sea of Galilee, we now gather beside Tampa Bay to clean and mend our nets," he said. "This is our business, because once every four years we have this need to get together to amend and fix the nets we know as United Methodism." To help them remember, delegates were given soft, blue silk prayer mantles handmade from United Methodists in all five U. S. jurisdictions. The mantles are a reminder that throughout the conference United Methodists will be praying for them. "We are here to do God's work and we are never alone," said McFee as she asked the delegates to put the mantles on. The service ended with Holy Communion as delegates were sent out to begin their work. "I have it on good authority that Jesus will show up here in Tampa while we are busy with our nets," Goodpaster said. Using the scripture, Mark 1:14-20, Goodpaster said that like the disciples beside the sea of Galilee, "we will be invited to leave it all behind and follow Jesus." *Gilbert is a writer specializing in young adult issues for United Methodist Communications, Nashville, Tenn.
News media contact: Kathy L. Gilbert, General Conference News Desk, (813) 574-4837, through May 4, or newsdesk@umcom.org.